... 1912 (100 years ago today), a daughter, Barbara Wertheim, was born into a banking family in New York (her maternal uncle, Henry Morgenthau Jr., would become President Franklin D. Roosevelt's Treasury Secretary). After completing her bachelor's degree at Radcliffe, she 1st worked in an unpaid position with a policy group in Tokyo. In 1936 she became a journalist at The Nation, which her father had bought; year later, she covered the Spanish Civil War for that periodical. 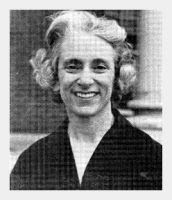 Married in 1939 to a physician who worked in a military hospital abroad during World War II, Barbara Tuchman (right) went to work for the U.S. Office of War Information in New York. (photo credit) After the war Tuchman, by then the mother of 3 daughters (we've posted on one of them here), began a writing career that would culminate in an account of the causes of World War I, titled The Guns of August (1962), that would win the Pulitzer Prize. She won a 2d Pulitzer 9 years later, for her biographical study of early 20th C. relations with China, Stillwell and the American Experience in China, 1911-1945 (1971). Tuchman died in 1989 at age 77.